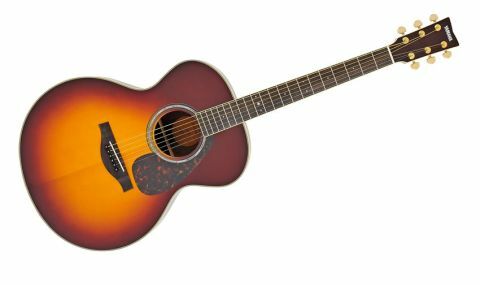 Almost unbelievable value for money for such a capable, quality electro-acoustic, especially in Sunburst! Incredible value. 'Zero Impact' pickups. Lovely neck. Great build quality. The new Chinese-built 6 L Series guitars represent an auspicious meeting of Yamaha's ultra-credible heritage with distinctly mid-level pricing. All the new 6 Series guitars get a solid Engelmann spruce top, treated with Yamaha's ARE process, previously available only on the (Japanese-made) 26 Series guitars and up. The company goes into plenty of detail in its marketing materials about ARE, claiming that by manipulating temperature, humidity and pressure at a 'sub-cellular' level, the spruce's molecular structure is changed to be closer to what it would be after many years of playing and use: it's 'played in', 'older', or however you want to term it. Easier to understand is the new, lower-profile, non-scalloped X-bracing structure that Yamaha has developed to increase volume and improve bass response over previous models. All 6 Series instruments have laminated mahogany or rosewood back and side options, not to mention a reasonable range of finishes, depending on model. "There's no second strap button, so you'll need to tie your strap - just as Woody Guthrie, Elvis and Bob Dylan did"
The amount of urethane finish build-up where neck meets body doesn't look great, but it's not an indicator of a too-thick finish on the bodies; you can just about perceive some of the spruce's grain undulations beneath the gloss, which is just how we like it. Yamaha has also redesigned the neck profile, firstly with a straighter taper in terms of depth than previous models - less increase in thickness as you go up the neck. That said, the profile itself has become a little more chubby; it's slightly less 'V' than before, and with the fingerboard/binding edges less rolled, and therefore more pronounced-feeling. Yamaha's hope is to offer a more traditional acoustic feel for 'new folk' styles, which it sees as predominantly strumming with a bit of fingerpicking and, interestingly, with some thought given to the feel when stood up; although there's no second strap button, so you'll need to tie your strap - just as Woody Guthrie, Elvis and Bob Dylan did - around the neck/peghead. The good news there is that the L Series neck is now a five-piece mahogany and rosewood laminate (instead of three), offering increased strength and rigidity, and enabling more efficient use of timber to boot. It also means that the neck will contribute to the guitar's overall resonance in a different way than it would were it constructed from a single piece of mahogany. It's a proper, glued mortise and tenon joint, for the record. We like this neck; it has enough meat to feel traditional and a good compromise of string spacing choices to suit strumming and picking. But we can't help wondering if Yamaha would have been better off optimising the nut width and string spacing for the style in which it's most likely to be played: wider on the LS, narrower on the jumbo. As ever with Yamaha, the standard of finishing is superb, almost to the point where we forget to comment on it. Setup is very much a personal preference; our opinion is that most players like low-ish actions and an easy feel - exactly what this guitar offers - while others prefer more height and fight to suit their picking styles, and so the strings have more room to sing out. While the guitar has a pickup, the only visible clue is the endpin jack socket: no preamp, no battery, no controls, nothing. It's a far cry from the active systems in other models; there's a far more simple 'Zero Impact' passive undersaddle pickup (the PU-R pickup element, which is the same as in Yamaha's A Series instruments). It's a brave move for Yamaha to eliminate all onboard control and suggest that users need either a DI or outboard preamp to get the best from the guitar. 'Keep it simple' seems to be Yamaha's new approach, and we're never going to argue with that. Before we move on, shall we take a second to draw attention to the LJ6's stunning looks? Is Yamaha sure the street price is really below £500? The laminate mahogany-bodied LJ6 is less developed-sounding than our recently-tested, posher 16 Series Yamaha Ls; there's slightly more superficial sizzle, perhaps as a result of the laminate timbers, perhaps as a result of the slightly larger body that tends to drop the mid-range prominence back a touch. "That sweetness is all there, punching far above its price point with a tone that suits rhythm strumming very well"
Things improve with a heavier set of phosphor bronze strings, and that sweetness is all there, punching far above its price point with a tone that suits rhythm strumming very well; beginners and acoustic newbies might find the sound more forgiving and pleasing than the LS16M, for example. Plugged in, the 'Zero Impact' passive pickups are instantly likeable. With our reference AER Compact 60 3 set with flat EQ in channel one (high-input sensitivity selected, 'colour' deactivated), there's plenty of output from the passive system that returns a very balanced all-round tone. There are no obvious feedback issues, minimal quacky piezo mids and no razor-sharp highs. A few of us here do live sound from time to time, and we'd be very happy to receive this signal to the desk. The current popularity of 'new folk' music will do no harm at all to Yamaha's upgraded 6 Series guitars and all the 6s are likely to be popular in pure, no-brainer affordability terms. More important is the timeless approach that makes those guitars just as relevant in 2014 as they would have been at almost any point in the 40 years since the L Series first appeared.